President Obama attempting to strangle Stephen Hawking. 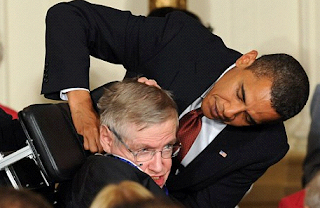 Today in a special meeting away from the White House, President Obama tried to strangle Stephen Hawking over his remarks that God doesn't exist and physics can explain everything. God chimed in during the attempted strangling, "Stephen, if you don't take that back, I'll make you a gimp in a wheelchair. Oooops... sorry, already did that." Aids to Hawking are saying that he really didn't mean what he said and that he has early onset Alzheimer's and he merely forgot there was a God. Hawking virulently denied having Alzheimer's and said in the next 100 years he will prove that the Big Bang was just an equation of physics and any moron could have figured it out, given enough time. Creationists were seen at Wal-Mart stocking up on Noah's Ark toys and the Barbie and Ken Adam and Eve collector's series. "It's all fairy tales," drooled Hawking, who is world renowned for having the most powerful brain on the planet. Rumor is, if you hook jumper cables to his ears, you can run a Chevy Volt from New York to San Francisco without stopping. You just have to put up with Hawking tearing apart your religion, the Bible, the Koran, the Talmud, the Book of Moron, the Jehovah's Witness pamphlets, the Torah, The Secret and the entire Harry Potter series. Geez, it will be a long road trip. Hope you bring snacks. Today, though, President Obama strangles Stephen Hawking over God doesn't exist remarks. "God exists, just like my birth certificate. And we can thank Donald Trump for that."